There is always room in your recipe collection for another way to prepare a chicken breast. So here’s an easy, delicious and perhaps new way to make those chicken breasts exciting. This recipe takes a little longer to bake, but it is worth the wait. 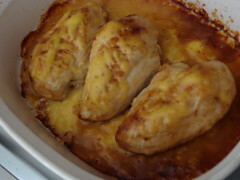 Brown chicken breasts in butter or margarine. 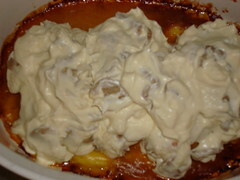 Place in baking dish with a cover. Add 1/2 of the can of cream of chicken soup. Bake at 350°, covered, for one hour. Combine sour cream with remaining cream of chicken soup. Cover and continue baking at 325° for 25 minutes. There’s not too many rules here. You could cut the chicken breasts into thirds or ooh pound them thin…stretch the chicken breasts any way you’d like depending on the number of people at the table. Not that exciting yet? Here is where the goodness kicks in. I mixed the remainder of the soup with sour cream and mushrooms. Spooned all that over the chicken breasts. It makes quite a heap. Then covered the dish up and finished baking for 25 more minutes. I’d have to say the sauce was my favorite part, so don’t leave any in the pan! 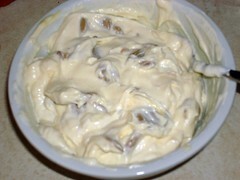 It was very rich, almost cream cheese-like, and the mushrooms rocked! 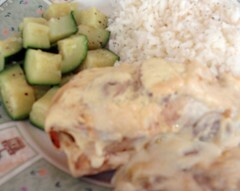 This picture doesn’t do these Chicken Breasts Baked in Sour Cream justice, so trust me and try the recipe for yourself. Yum!